We’d been moving fast and furious on the road so we were more than excited to bunk up with a friend on our visit to Beijing. 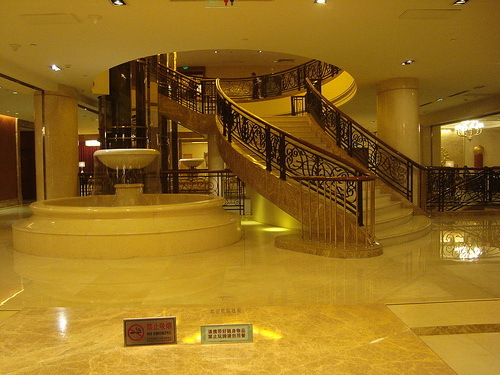 Here we were able to enjoy many comforts of home from a posh Peking pad. We hung up our budget traveler shoes, for the time being, as my buddy would be showing us the high life. First stop was dining at a sophisticated restaurant where we rubbed elbows with Beijing’s elite. 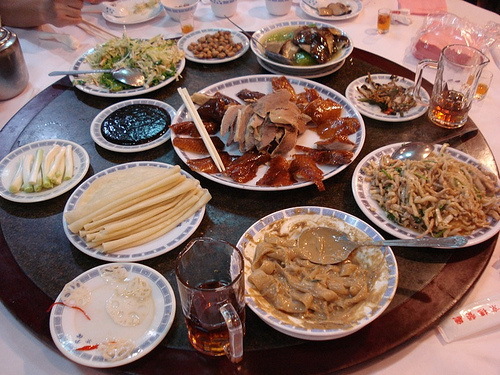 My buddy treated us to a memorable feast of succulent Peking duck – a meal I’ll be dreaming about until my return. Next up it was time to play tourist with a visit to Tiananmen Square and the Forbidden City (what happened here is a story in and of itself and deserves its own post – check it out here). 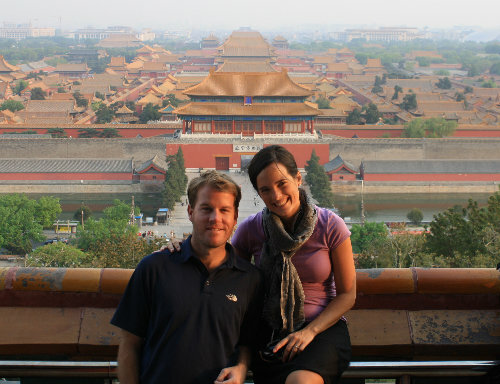 Most memorable was watching the sunset over the Forbidden City from the hill at Jinshang Park. Breathtaking! The culinary food adventure continued (and would be a theme of our visit to Beijing). We were scheduled for a big night out and were excited to have two of our pals and fellow round the world Chicago travelers (check out their blog here) along with us for the ride. 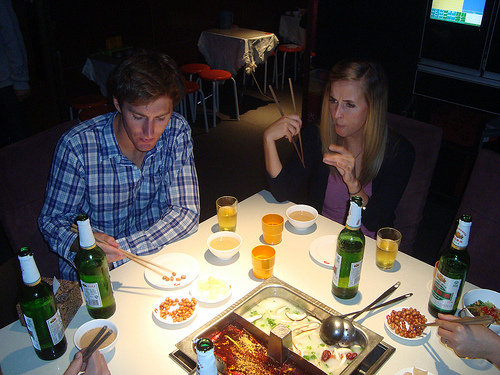 To get things going we headed to Beijing’s hottest hot pot destination. This meal consists of a huge pot of boiling water in the middle of the table with a variety of herbs and spices added to it. You dip in your meat and vegetables and cook them to your liking before dunking them into a delicious peanut sauce. I liked to call it China’s version of fondue. Best part was undoubtedly the noodle-making ninja (see video here) who brought his skills tableside. Hoping to save the best for last, we headed to the Great Wall of China on our final day in Beijing. This was a huge mistake, as our debauchery in Peking had us out till the wee hours of the morning for three consecutive nights. By the time our Great Wall visit was in order, we were unfortunately feeling exhausted…and yes, I must admit, a wee bit hung-over. We were in less than ideal shape to enjoy the splendor of the Great Wall, but amidst this gloomy, foggy day, we did our best to take it all in. Next time, on the eve of seeing one of the world’s greatest sights, I’ll be sure to pull the reins our nightlife activities. Lesson learned.